Great rate on travel money. Top up your Travelex Money Card and check your balance on the go with our Travelex Money App. Order your Travelex Money card online, over the phone or in your local Travelex store. Pick up your card from any of our Travelex stores. Activate your card online to manage your account with ease. It’s important to remember that there are a few things that your card’s not built for. To get the most out of your card, we recommend that you don’t use it for: reserving a hire car, a hotel room, or on a cruise. For more information, please see the fees and limits. If your travel card is damaged, lost, stolen or misused, please contact Card Services immediately. If you requested an additional backup prepaid card, you can continue accessing and spending your funds with no delay. If you don’t have a backup card, don’t worry; a replacement travel card can be organised for you. Alternatively, we can arrange for emergency cash in the local currency (up to the value remaining on the card and subject to availability), anywhere in the world, normally within 20 minutes (in some remote locations this could take up to 24 hours). Call Card Services 24 hours a day, seven days a week. You can find contact numbers here. Is the prepaid card contactless? 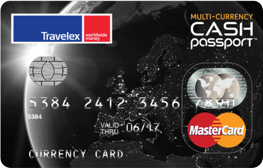 Travelex Money Card is Mastercard contactless enabled. Mastercard contactless is the faster way to pay for purchases of under AUD 100. No signature or PIN is required. Just tap your card against the reader and go. For more information, please click here. If you choose to buy a Travelex Money Card and already have an existing Cash Passport, you will need to transfer the balance on your Cash Passport to the Travelex Money Card within 30 days of the purchase of the Travelex Money Card. 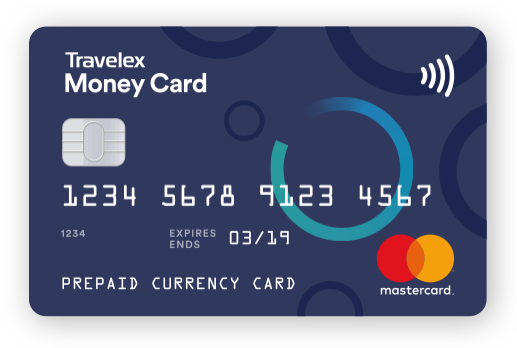 The Travelex Money Card is an enhanced product, with contactless functionality, free Global Wifi hotspots and unique merchant offers. To find out more about the benefits of the Travelex Money Card, visit Travelex.com.au/travel-money-card. It’ll still have the same security, won’t be linked to your bank account and is still Chip and PIN protected. However, if you do not want to purchase the Travelex Money Card, you can still use your existing Multi-currency Cash Passport. Please note, we are no longer selling Cash Passport. The app requires Android 5.0 and up or iOS 10.0 or later. Compatible with iPhone, iPad and iPod touch. If you’re one of our existing Cash Passport customers, not to worry. You can still use your existing Cash Passport card until the expiration date on the front of the card. However, the good news is that you can order and use your Travelex Money Card now, even whilst your current card is still valid. You can also transfer the balance from your existing Cash Passport to your new Travelex Money Card, in the same currencies and at no extra cost by contacting Card Services. For more information on this, please read our FAQs. From the hottest destinations to last minute travel and family fun, here's to making your next trip the best one yet. Why not buy our prepaid travel card and get all the great benefits to enjoy all year round? Sign up to our newsletter to stay in the know about all of our latest developments, as well as receive exclusive offers and discounts. What is a currency card? 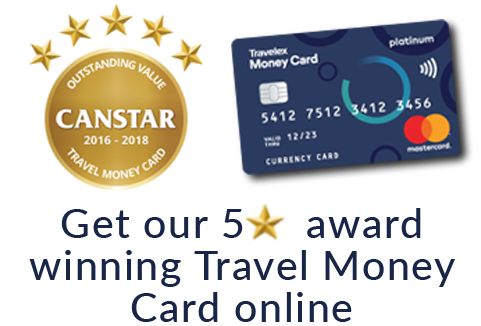 If you’d prefer not to carry loads of cash on your trip, a travel money card is a convenient and easy way to carry your travel money on a PIN protected card. All you need to do is load up the card in the currency you need before you depart and you’ll be able to use it similar to a bank card on your trip overseas. You’ll be able to use it to pay for things in stores, restaurants, and hotels, as well as to withdraw money from an ATM overseas. How do you use a prepaid card abroad? It’s really simple to use a prepaid travel card overseas because it works just like your debit or credit card. To use your Travelex Money Card on your trip, simply top it up with the currency you need – you can do this online, over the phone or via the Travelex Money app. After that, you’ll be ready to spend wherever you see the Mastercard acceptance mark – that’s millions of locations around the world! And if you like having some cash with you when you’re abroad, then you can withdraw cash from your prepaid currency card through an ATM. Just remember to keep in mind that some ATMs will charge their own fees, even if the prepaid card itself has no fees for ATM use. Why use a prepaid travel card? There a few great reasons to use a global currency card when you’re travelling overseas. Firstly, a prepaid money card is a great way to help control your budget on your trip. Top up your card with that amount so you can keep track of your outgoings as you carry on enjoying your trip. Secondly, with a prepaid card you can lock in your exchange rate at the rate that you top up your card with. This means that waiting until the rate is favourable to top up your card could see you score a great deal on your currency. It also protects you from any rate fluctuations, where the value of the dollar could change right in the middle of your trip! How long your prepaid card takes to arrive will depend on where you’ve ordered it from. With the Travelex Money Card, simply order your card online and you’ll be able to pick it up from one of our stores . Or if you prefer, you can head straight to one of our stores to order your card in person from one of our team. 1. The currencies available in respect of Travelex Money Card may vary from time to time and not all currencies may be available at all times. 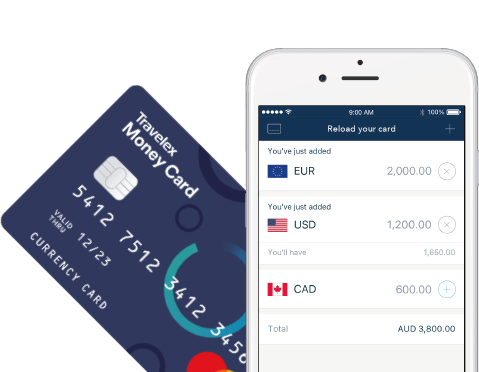 Australian dollars are not available for load or reload onto a Travelex Money Card online. Load or reload up to 10 currencies in store or up to 9 currencies online. Before you make a decision to acquire the Card, please check the available currencies online or by asking in store.